Third Millennium believes that every Christian deserves a well-trained pastor. Thus, we aim to provide Christian education to hundreds of thousands of pastors around the world, in their own land and language, who lack sufficient training for ministry. The ThirdMill Certificate delivered by the BibleMesh Institute is an 8 course, 24 credit-hr certificate that is transferable to certain BibleMesh partner schools. This Certificate is custom designed for the Master of Arts in Christian Studies at Southeastern Baptist Theological Seminary. Students complete the 8 course ThirdMill Certificate through the BibleMesh Institute, then complete the remaining 5 courses through Southeastern to receive the Master of Arts degree. Complete this degree within 2 years for under $10,000. This course offers an introduction to the history, literature, and cultural context of the Old Testament, with specific focus given to the interpretation and theology of the Pentateuch and its relation to the overarching narrative of Scripture. This course offers an introduction to the history, literature, and cultural context of the Old Testament, with specific focus given to the problems and interpretations of the Prophets and the Writings, along with the overarching themes of kingdom and covenant throughout the Old Testament. This course offers an introduction to the history, literature, and cultural context of the New Testament, with specific focus given to the interpretation and theology of the Gospels and Acts, and the relationship of the New Testament to the Old Testament through the themes of kingdom and covenant. This course offers an introduction to the history, literature, and cultural context of the New Testament, with specific focus given to the interpretation and theology of the Pauline epistles, the general epistles, and the book of Revelation. This course offers an introduction to the foundations of Christian theology through the study of the doctrines of Prolegomena, Revelation, God, Humanity, and Sin. This course covers the nature of the task of theology, the major biblical, historical, and systematic contours of each doctrine, and their significance for Christian life. This course offers an introduction to the foundations of Christian theology through the study of the doctrines of Christ, Salvation, the Holy Spirit, the Church, and the End Times. This course covers the major biblical, historical, and systematic contours of each doctrine, and their significance for Christian life. This course offers an introduction to the history of the Christian church and the development of doctrine throughout the four major eras: Patristic, Medieval, Reformation, and Modern. Special attention is given to historic creeds and confessions, along with major figures, controversies, and councils. This course offers an overview of the Bible’s system of morality in terms of ethical standards, goals, and motives while equipping Christians to understand biblical standards in application to modern dilemmas. How do I begin my studies to earn my Third Millennium Certificate? First, you need to apply to the BibleMesh Institute by going here. Be sure to select “Third Millennium Certificate” as the program you are interested in. Upon your enrollment in the Institute, we will assign you a qualified academic tutor who will guide you through each course of study. Can I speak to someone for advice? Students enroll in the BibleMesh Institute on a subscription basis. 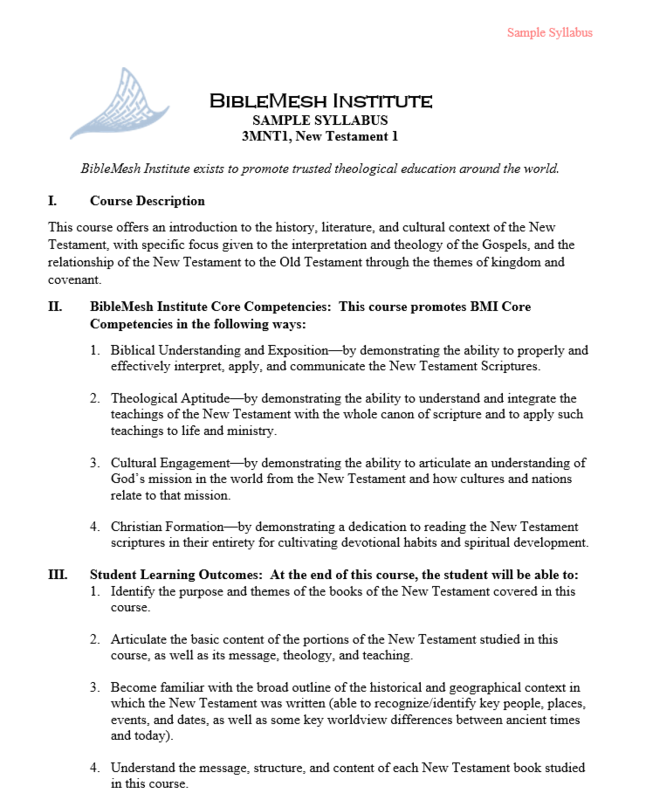 The monthly cost for each BibleMesh Institute IIIM-Certificate course is $250 per month. The length of time to complete a course varies depending on each student’s situation, but averages 3 months for dedicated students. Is there a teacher – or do I study these online courses by myself? The BibleMesh Institute assigns each student an academic tutor for each course. All of our proctors (academic tutors) are highly trained in their subject area and are prepared to walk alongside you through your courses, monitoring your progress and answering your questions. Yes. Each course is provided with month-to-month access to better fit your situation. You may work through and complete a course as your schedule allows, while your academic tutor guides you to ensure competency and mastery of the content. You may take as much time as you wish to complete an individual course or a certificate program. Can I skip certain courses or pause in my coursework? In order to complete a certificate program, students must complete every course within that program. Some certificates, like the Biblical Languages certificate, do require courses to be completed in a specific sequence. If you need to pause your studies, you can; your progress and grades will not be lost. You can simply renew your monthly course subscription and resume from where you left off. Can anyone receive a Third Millennium Certificate from the BibleMesh Institute? Yes, anyone can take the eight courses listed in the track and receive the diploma. To earn the Master of Arts from SEBTS, one must successfully complete the eight courses and then transfer into SEBTS degree program..
How do I receive the certificate? Upon finishing all the courses in this program, you may apply for and receive a certificate. When scholarships are available they are initially available to students already studying in the BibleMesh Institute. Students may request a family discount when two or more family members are actively enrolled in courses through BMI. Are BibleMesh Institute certificates recognized for credit by colleges and seminaries? Yes. Several partnering colleges and seminaries provide academic pathways using courses and programs offered through the Institute. Credit-bearing courses provided through the BibleMesh Institute are built to accreditation standards. If you would like us to talk with your school about the possibility of accepting transfer credits for BibleMesh Institute courses or programs, please contact us.